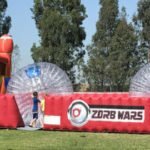 In Zorb Wars, players enter the large inflatable arena, climb into their Zorb ball and prepare for a human hamster ball battle royale! When the attendant says “go”, players make a mad dash toward their opponent and try to roll them back, causing them to lose their footing in their own Zorb ball. Can you wear them out? Two to four players (Zorbs) can compete in this ultimate competition for supremacy!